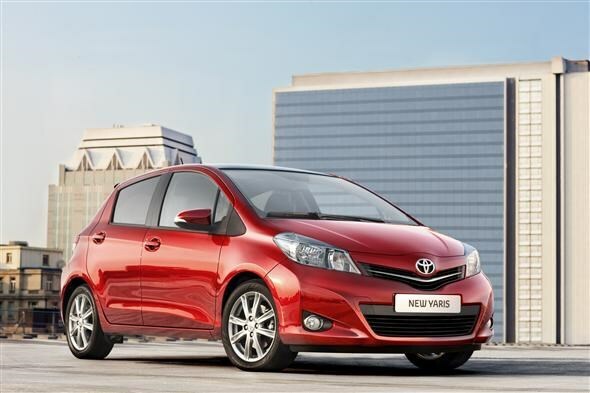 Toyota has released details of its Fiesta-rivalling new Yaris. Now in its third incarnation, the Japanese supermini is bigger than ever yet hopes to continue the ‘compact outside, spacious inside' theme of the past two generations. Make no mistake, this is no mild facelift. The new car is 100mm longer than its predecessor yet 20mm lower - dropping the centre of gravity to improve handling, according to the Japanese firm. Loadspace in the two-tier boot is now 347 litres - up from 272 litres in the old car - and expanding to 768 litres when the 60:40-split rear seats are folded flat. Styling has obviously been influenced by Toyota's bigger models - the ‘family face' seen on the Auris has been carried over, yet Toyota has added some distinctive curving to the grille to keep things looking contemporary. Upon launch there will be three Euro-5 compliant engines available. First up is a 1.0-litre petrol engine coupled with a five-speed manual gearbox, making 68bhp and claimed to emit 111g/km CO2 while returning 58.9mpg. Next there's a 1.33-litre petrol unit that when mated to Toyota's Multidrive S transmission - a continuously variable transmission (CVT) as found on other Toyota models - will make 98bhp, with emissions expected to be 118g/km and fuel economy 56.5mpg. Finally, a 1.4-litre diesel engine will be mated to a six-speed manual gearbox and will get 89bhp, emitting around 104g/km CO2 and allegedly capable of 72.4mpg. Around the middle of next year there will be a hybrid Yaris, which will use a 1.5-litre petrol engine mated to an electric motor via a slimmed-down version of the system currently used in the Prius and Auris HSD. There are no official statistics available yet, but expect CO2 emissions below 89g/km and very impressive fuel economy. There will be four trim levels available upon launch. 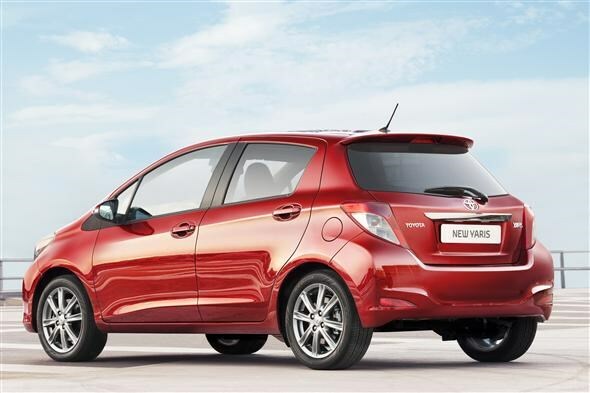 T2 is the base spec, and gets the 1.0-litre engine with steel wheels and no ‘Toyota Touch', which in turn means no rear-view camera. It also includes black door handles and black mirrors, and not much else. However, the firm expects just 4% of buyers to go for the bottom spec. Next up is TR spec, which adds 15-inch alloys, air con, Toyota Touch (including Bluetooth, vehicle information display and rear parking camera), leather steering wheel and colour-matched wing mirrors. SR trim means you also get 16-inch alloys, a rear roof spoiler, front fog lamps, a black from grille, part-leather upholstery, rear privacy glass, front footwell illumination, a slightly lower ride-height and a sports steering wheel. It's available exclusively with the 1.33-litre petrol engine. Top spec ‘T Spirit' models get a panoramic glass roof as standard, along with dual zone climate control, automatic headlights and wipers, an auto-dimming rear view mirror and smart entry/start. Again, this trim level is only available with the 1.33-litre engine. 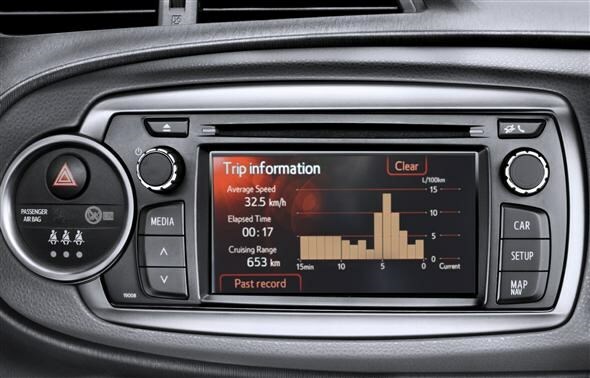 You can also upgrade to Toyota's Touch and Go system, which is expected to cost £500 and adds an impressive list of functions to the 'Touch', including SMS text messaging, wireless audio streaming, the ability to check fuel local pricing for the best deal, an eco-route planning system which tells you the most economical way to get to your destination and an interface with Google Local Search to find what you're looking for locally. Prices for the new Yaris start at £11,170 for a 3dr T2 - around £2,500 more than the base-spec Ford Fiesta ‘Studio' which also comes with more standard equipment. Can the Yaris hope to steal business from one of the most popular small cars on sale today? Keep an eye out for the full road test to find out.